On November 14, 2003, the Minnesota Twins traded A.J. Pierzynski to the SF Giants for Joe Nathan, Francisco Liriano, and Boof Bonser. Twins fans everywhere would like to thank Brian Sabean. With the success of the San Francisco Giants, it might be tough to get SF Giants Tickets. They are coming off of another World Series, and have a lot of talent in place to make another run. They are anchored by their pitching staff. Their ace is Matt Cain, who continues to be a great starter for them. He has great stuff, and is one of the best strikeout pitchers in the game. Madison Bumgartner is another guy that has a very bright future for them. Their work in assembling a quality staff is one of the biggest reasons they have had so much success over the past few years. If Tim Lincecum can regain his form, the rotation will be even better. He was a Cy Young winner earlier in his career, but struggled with his control and velocity last season. He is a big piece for them, and they hope he can bounce back. He helped their bullpen in the postseason, and that area should remain strong for them. Guys like Sergio Romo and Santiago Casilla are two of the best out of the pen for them. They also have a great position player in Buster Posey, who was the NL MVP last season. Even though he is a catcher, he was one of the best hitters in the league, in addition to being very good defensively. He looks to build off his great season, and if he does, he could win another MVP award. The Giants have a lot of other really good young hitters, such as Brandon Belt and Pablo Sandoval. Both guys are capable of hitting .300, and they can hit with some power as well. Sandoval was a guy that was one of their World Series heroes last year, as he hit a bunch of homers in the Series. Another reason it's tough to get a ticket is because the Giants play in one of the best ballparks in the MLB. Right on McCovey Cove, it offers great surroundings and a great experience in the ballpark. It is a must for all MLB fans to go to a game there. For all of these reasons, you want to get your tickets early if you are going to go a Giants game. They are one of the premier ballclubs in baseball, and they will be a tough ticket this year. Out of all major league teams, they have to be one of the most fun to watch in person, both because of their team and because of their ballpark. This book review was originally posted on Reed Reads. I got the chance to read The Extra 2%: How Wall Street Strategies Took a Major League Baseball Team from Worst to First by Jonah Keri and thought this it was a fantastic book. The book begins by talking about the early parts of the Tampa Bay Devil Rays franchise - how they came to be, and how they first ran things under the initial owner and general manager. It was a period marked by futility, alternating strategies, and a lot of losing. Fans lost interest, and the D-Rays were a joke of an MLB franchise. Around the mid 2000s, they were sold to a buyer that had a history on Wall Street. The people he hired to run the team also had extensive experience on Wall Street, which is where the title of the book comes from. It talks about some of the areas where the Rays looked for inefficiencies in the market to build the baseball team, since they knew they would not have the financial resources to compete against teams like the New York Yankees or Boston Red Sox. The book's most obvious comparison is Moneyball by Michael Lewis. It wants to be like that, and reaches out for the same fans that liked Moneyball. It is not that good - the detail into what makes the Rays successful is not shown in nearly as much detail as Lewis' famous book, but it is a great look into an MLB franchise. Last year the Minnesota Twins were one of the most disappointing teams in all of baseball. In their second year in Target Field, coming off of an AL Central title and expected to win another, they battled through a plethora of injuries and inconsistency, floundering to a last place finish in the division. This happened even though the Twins had the highest payroll in team history. One of the biggest reasons for the struggles was that Justin Morneau never really fully recovered from his injury the previous year. He was an MVP candidate two years ago before he got injured, but has not regained that form. Another guy that missed a lot of games was their star, Joe Mauer. He is one of the best players in the MLB when he is healthy, but he suffered from a variety of injuries last year. Any online betting you would do on the Twins would be risky because of the health of these two guys. This year, the Twins are a prime candidate to have a bounceback season. Just by pure chance they can't have as many injuries as they had last season, which will be huge for them. No team can win when its best players are missing, and the Twins were no different. They also had a lot of youth and inconsistency with their pitching, but hopefully that will be better. They also need to upgrade the bullpen a lot, as that was a weak spot. If they can do those things, they will have a chance to be back at the top of the AL Central. Although the Hot Stove League has just begun there are some outstanding angles to consider as we look ahead to the 2012 season. One of the best ways to handicap baseball is with a long term outlook and to consider each team like you would a commodity on the stock market. The old adage about “buy low and sell high” certainly comes into play as there are teams that exceeded or fell far short of their expectations and or capabilities in 2011 and that likely means a potential “market correction” on the MLB betting is the place to look for odds for 2012. A good place to start is with the World Series champion St. Louis Cardinals. The Redbirds pulled off a stunning comeback season as they were over 10 games out of a wild card spot with a month to play before catching fire and winning at a 70 percent plus clip in the final weeks which coincided with an epic collapse by the Atlanta Braves in the National League wild card race. With the retirement of manager Tony LaRussa and the unique set of circumstances that surrounded the Cardinals title run it is possible that the Redbirds will be over-valued in 2012 as a “name brand” team that garners plenty of public attention and dollars. Speaking of the Braves they will also face a lot of skepticism in 2012. The question must be asked as to whether or not Atlanta can recover from that collapse of the ages this past September or if that was a portent of things to come. The Braves certainly must address their anemic batting lineup that offered their solid pitching staff no run support down the stretch. Atlanta must bulk up on run production if they are to get back into the post season and not allow their good arms to go to waste as they did in 2011. The ultimate “sell stock” for 2012 in MLB betting is likely to be the Arizona Diamondbacks who became a “worst to first” story in 2011 with their long shot run as National League West Division champions. Nobody saw the D-Backs coming and it will be hard for a team that came from the bottom of the division to repeat as champions with San Francisco likely to roar back into contention for 2012. A good potential “buy stock” in 2012 also comes from the NL West as the Colorado Rockies fell far short of preseason expectations as a team that was picked to win the West but instead ended up 73-89. Bill Smith, this doesn't exactly inspire confidence. After being swept by the Indians, the Twins are 8.5 GB with 29 games remaining. My guess is that they'd pretty much need to go undefeated to have a chance. Obviously that's not happening. PLEASE Terry Ryan, resign him ASAP! With the Indians and [especially] the Tigers struggling lately, the past couple of weeks would have been a perfect time for the Twins to make a big run towards the front of the division. Instead, they've just sort of been staying place, which is frustrating, especially losing 2 of 3 to the Royals. Once again, Matt Garza had an outstanding performance, only to get no run support. That means that in 4 of the last 5 games the Twins have scored 1 run or less. On Thursday it was the always unbeatable Kyle Davies that shut them down. And this lack of offensive punch certainly can't be blamed on the fact that Luis Castillo is no longer with the club. His replacement, Alexi Casilla, was the only Twins to have more than one hit. Even so, the Twins right now are only 5 games behind Detroit, and 6 games behind Cleveland pending their game later Thursday. The pitching appears to be really coming together, as the starters have put together a lot of nice performances lately. Now they just need the hitters to start carrying their weight. Not a great way to start this hugely important series with the Tigers... going in, the Twins has to be thinking that winning 2 of 3 at home would be enough to get them within 5 games of the Tigers. Now, they just need to focus on salvaging 1 game of the series. Thanks to the lack of timely hitting, the Twins have managed to score 2 runs in 2 games... still had their chances to win both. You can't fault the pitching efforts of either Matt Garza or Johan Santana, who were superb. Garza gave up just 1 unearned run (and had a really nice array of offspeed stuff), and Santana gave up just a manageable 3 runs. The offense certainly had chances. On Wednesday's game the Twins left 14 runners stranded, including 4 runners left at third base. It was the Twins best hitters that did most of the damage, as Joe Mauer and Justin Morneau were a combined 1/9 with 1 BB, and they left 11 runners on base. It's tough to win like that. Following Wednesday's game the Twins stand 8 games behind the division-leading Tigers and 6 games behind the Wildcard-leading Indians. The series finale will feature Scott Baker for the Twins going against Jeremy Bonderman. There's still a long way to go in this season, but the Twins can ill afford a sweep. Just a reminder to go vote for Pat Neshek to make it onto the All-Star game! With a 1.37 ERA, a fantastic K/BB ratio, and being very stingy about giving up hits, Neshek is the best middle reliever in the MLB! I don't really know that this needs to be said, but I love the Twins bullpen. Sure, sometimes they'll screw up and Juan Rincon will have a stretch like he had recently, but then they do something like they did tonight, and I'm right back in. That's beautiful. And excellent managing of the bullpen as well. They used Reyes for one out, then went with the best guys. Neshek pitched 1.2 innings of good work (even though he did allow a sac fly), Joe Nathan was then brought in for 2 shutout innings, and then Juan Rincon pitched a scoreless inning. Great management of the pen, great pitching by the pen, and a nice win. And a round of applause for Scott Baker. In my last post way back when, I wondered if it could be Baker's last chance. Well, he has come back and had 2 straight solid starts, including a really good win on Tuesday. 7+ innings, 4 H, 1 ER, 9 K. I'll take that. Also, another brilliant managing move bringing in Jeff Cirillo in the 12th to pinch hit. This isn't even hindsight bias, as I thought it was an excellent move at the time. Cirillo is a very solid hitter against lefties, and it just made perfect sense to bring him in there. Sometimes managers don't do what seems to make perfect sense, but the Twins did here and it worked out, with Cirillo delivering the game-winning single. Twins now stand at 39-36, 5.5 games back of the Indians and Tigers... but for some reason, I just have a really good feeling about these guys. After getting shut down for 8 innings, the Twins came through in the 9th on Thursday, getting Johan Santana off the hook for another home loss. Johan pitched very well, allowing 2 runs and striking out 9 in 7 innings, but the Twins just could not get to Tim Hudson or Rafael Soriano, who combined for shutout innings. But against old nemesis Bob Wickman in the 9th, the floodgates opened. Castillo singled, and following a Mauer groundout, he scored on a triple by Michael Cuddyer. After a grounder by Morneau that was misplayed by the first baseman, there were runners on 1st and 3rd for Hunter. His AB wasn't pretty, but ultimately a weak grounder that eventually led to an error on 3B Yunel Escobar tied the game, and then the Twins won on a base hit to left by Mike Redmond. So it doesn't matter how you do it... it doesn't matter that the Braves pitching staff dominated this game for 8 innings, all that matters is that the Twins have now won 4 straight and remain just 5.5 back of the Indians, and only 4 back of the Tigers. On Friday Scott Baker gets the call against the Brewers, and you have to think this might be one of Baker's final chances. He has a great track record, but the Twins have a lot of other good pitching prospects and Baker is struggling once again. He's had a couple straight mediocre starts, and I'm not sure how much more the Twins will give him. It wasn't quite an awe-inspiring performance, but it's good to see Kevin Slowey get his first Major League win in his second MLB start. Slowey only went 5 innings, giving up 10 hits, 5 runs, and 4 ER, but thanks to good work from the offense and from the bullpen it was good enough for the win. If I was doing any online sports betting, I would say this is the best bullpen in the MLB once again. Also, it becomes more and more clear (at least to me) that Pat Neshek is the best middle reliever in the MLB. In the 28.2 IP he has struck out 34 batters, walked only 10, and allowed only 12 hits. That puts his WHIP at 0.77, his OBA at .217, and SLG against at only .200. Those are unbelievable numbers. Offensively, the Twins got their power from Michael Cuddyer (3/4, 1 HR, 3 RBI), and a couple of other unlikely sources, as both Nick Punto and Jason Bartlett hit their first homers of the year. All in all, a nice day and a nice job to come from behind to salvage one game of the 3-game set, as we head into another round of interleague play. 3 games at home against a mediocre Washington Nationals team sounds like a recipe for success. The Twins offense is starting to hit their stride (even with Joe Mauer still out of the lineup for a little while longer), so no complaints there. Likewise, Carlos Silva was very good, so nothing but praise for him on this Memorial Day Weekend. But the best news, long-term, for the Twins was that Ramon Ortiz was moved to the bullpen. He was putting them in a hole everytime he started, and while his early season starts were very encouraging, something needed to happen, and that did when the Twins announced Ramon Ortiz would be moving to the pen. Though I disagree with the statement on the Twins site that the Twins bullpen got stronger with the move, I think it's very good overall for the Twins. This will likely cause them to call up Kevin Slowey, one of the top prospects in the organization. This will help them win now and later, as I think Slowey will be an immediate upgrade and gain valuable experience for the future. So all in all, a good weekend for the Twins, even with the heartbreaking loss on Saturday. As you have probably heard if you are a Twins blog reader (which you probably are if you're reading this site), Bat-Girl is ending her blog, and the time constraints of having a baby were, understandably, a bit overwhelming. As a Twins blogger, it was and is sometimes hard to produce content that is different from the other blogs and will be able to provide value for readers... Bat-Girl, I don't think, ever had that problem. Her blog was always unique, which is what made it so great to read. Good bye and good luck Bat-Girl... you'll be missed in the Twins blogging community. After another Sabean Special today, one thing has become clear to me... when we have good pitchers start, that usually goes better than having bad pitchers start. Groundbreaking, I know. But then again, we are still starting Carlos Silva and Ramon Ortiz for 40% of the games, so this message isn't quite getting through to somebody. Obviously it's a lot more complicated than this, but since May 12 the Twins are 5-1 when either Johan Santana, Boof Bonser, or Scott Baker starts. Over that same time span they're 0-6 when the games are started by Ramon Ortiz, Carlos Silva, and the recently departed Sidney Ponson. Already 6.5 games back, we can't really afford to trot out Ortiz and Silva much anymore, can we? I know this is kinda like a broken record, but these guys are just not good starters. That's not even an opinion, that's a fact. Why not give Matt Garza and Kevin Slowey a chance? I know the Twins are very reluctant to use more service time than necessary, but I really think the change to bring the young starters up has to be made soon. Last year these types of moves propelled the Twins from a .500 team to the division title. Replacing 3/5 of your rotation (already done with 1 part of that in Baker) can have that same type of effect. The Ramon Ortiz Story was great for a few starts... however, the time has come to pull the plug. Most of us knew this would happen sooner or later, and it's become increasingly apparent that the real Ramon Ortiz is back. He was good for 5 starts or so, but that was probably more of an abberation than anything. He wasn't striking guys out, and basically they were just hitting it where the Twins were. Over the past 4 starts that has begun to even out, and his ERA is showing it. Almost needless to say, the Twins have lost all 4 starts. It's time to end the Ramon Ortiz Experiment. A Win AND Sidney Ponson gets DFA! With 4 straight losses coming into the game, it had been a long weekend for the Twins. But on Sunday, good things happened on and off the field. On the field, the bats finally exploded. Hampered greatly ever since Mauer went to the DL, the Twins erupted for 16 runs and 4 HR, something sorely lacking for the offense this year. Torii Hunter led the way, with 2 HR and a career high 7 RBI. He had lots of help, as the Twins eventually had 16 runs and 22 hits. Luis Castillo had 3 hits. Mike Redmond hit a HR. Mike Cuddyer had 3 hits (including a HR) and 4 RBI. Justin Morneau had 3 hits. Jason Kubel had 3 hits. And on and on. Bottom line, it was a great hitting performance for the Twins, and something that they sorely needed. Off the field, after another poor start for Sidney Ponson, the Twins finally have seen enough, as they designated him for assignment. Later this week the Twins will recall a pitcher to start on Saturday, leaving Glen Perkins in the pen. They didn't say who, but my guess would be Scott Baker, who has some experience, is pitching great in AAA, and I believe is already on the 40-man roster. That would make the most sense to me. Either way, I'm at least happy to see the Twins recognized that Ponson just wasn't working out. Sorry for the extreme lack of updates over the weekend... finals week is this week, which means I've been studying a ton. But one more week until it's officially summer for me! The hitting was good, Sidney Ponson was very good (really), and that was a pretty good combination for the Twins en route to a 9-1 beatdown of the DRays. Ponson turned in easily his best performance of the year in a start in which he probably had to do well to keep his spot in the rotation. He threw 7 innings, allowing only 5 hits and 2 BB while striking out 5, allowing 1 run. Sure, that only lowers the ERA to 6.67, but this had to be really encouraging. If he can make a few more starts like this, they can delay starting the clock for some of those young guys even longer. On the hitting side, there were lots of positives. Joe Mauer continued his hot streak with 3 more hits to boost the average .378. Torii Hunter only had 1 hit, but it was yet another double, his 14th of the year. Jason Tyner had 3 hits. Luis Castillo had 3 hits in his return to the lineup. There were lots of hitting starts for the Twins. 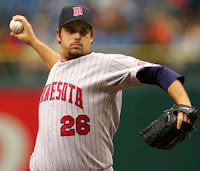 On Wednesday, Boof will get the start for the Twins, hoping Tampa has the same effect for him that it did for Sidney. He'll take on Jae Seo, he of a 9.51 ERA this year. If you would like to advertise on this site, exchange links, or contact me in any way, email me: uclabruins24@hotmail.com Have a great day! Alliance Tickets is your source for cheap MLB Tickets. We always carry a huge selection of Colorado Rockies Tickets and San Francisco Giants Tickets. Casinos - The best online casino directory and gambling guide. casinos along with game previews, payment details and company profile. some free casino games at Online Casino Advisory. Online Casino Bonuses - Find The best online casino guide with free casino games, no deposit casinos, and the best casino bonuses anywhere. TicketsNow puts you in the game with Tickets in the best seats including Twins Tickets, Cubs Tickets, and NFL Tickets! Watch the Twins take on the Detroit Tigers and the rest of Baseball as they work towards the World Series! Get Minnesota Twins Tickets from Tickco.com. We also have baseball tickets like the Boston Red Sox, Anaheim Angels, and more! Online Casino Guide - All Winners Online Casino Guide has been rating software of online casinos and poker rooms since 2002.